On Saturday night, former US president Bill Clinton presented Rutgers University’s Pakistani students Hassan Usmani, Hanna Lakhani, Moneed Mian and Gia Farooqi with US$1 million in start-up funding from the Hult Prize Foundation, a NGO dedicated to funding humanitarian initiatives. The award ceremony was held at New York’s United Nations headquarters where contestants from universities around the world gathered for the end of the year-long competition. The Pakistani group won the regional finals of the competition in March, out of 50,000 applicants, coincidentally a few days before Donald Trump announced a new executive order for a 120-day ban on Muslims from 7-Muslim majority countries entering United States. 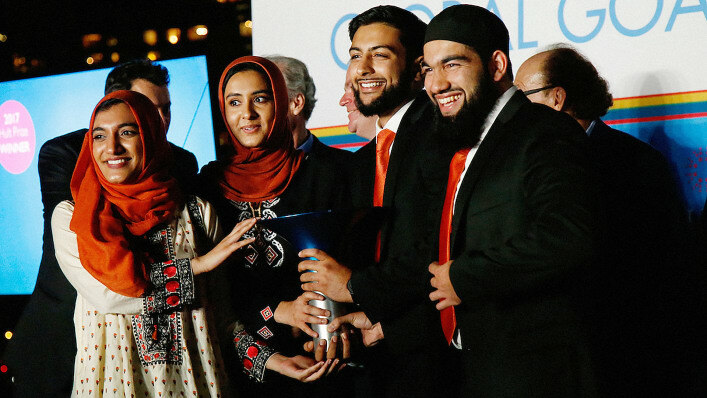 The Pakistani team beat groups from prestigious universities like Harvard, Yale and Purdue, and is one of five regional winners across the world, Umair Masood, Rutgers’ campus director for the Hult Prize, said. The challenge was issued by Bill Clinton, member of Hult Foundation board of trustees, tasked contestants with finding a plan to address the world’s refugees, providing employment and restoring dignity by 2022. The winning concept, Roshni (Light) Rides, is an eco-friendly rickshaw service, a two- or-three-wheeled passenger cart fueled by renewable energy that will allow refugees to travel with ease and without a financial burden. Korangi Town is considered one of Asia’s largest slums housing about 2.4 million refugees from India, Afghanistan, Bangladesh and Myanmar. “We hope to revolutionize the transportation world with Roshni Rides and help restore sufficiency and dignity to millions of refugees around the world,” Gia Farooqi said. According to UNHRC there are over 70 million refugees worldwide. Muslim refugees make 60% of that count. The Hult Prize is world’s largest prize for innovative university students. It was established in 2012 by Swedish billionaire entrepreneur Bertil Eric Hult, 76, who dropped-out from school after junior high.